Okay, let’s jump in. These are in random order and not necessarily in order of importance or prevalence. You want 5 chickens in your flock, so you buy 5 babies. Two of them turn out to be roosters. Now you’re down to 3 hens. You want to hatch out eggs (or let a hen hatch them out) and you get 7 eggs. Five of them hatch. Two don’t. Two are roosters. Now you have 3 hens from 7 eggs. Or…you have 5 hens and a dog in the neighborhood gets loose and reduces your flock to three. I always say buy at least one or two more than you think you want to end up with. Just to play it safe. Because with chickens, you just never know. Chicken math goes the other way too. You get 5 chickens and then next spring you want 10 more, and then later, another 15. haha. Yep, that’s also chicken math! It’s so true! Which is why you need a coop for them to live in BEFORE you buy chicks. I always suggest that you build/buy/acquire your coop before you even go ‘just to look’ at chicks. I’m speaking from experience…my first chicks were nearly grown before I had their coop finished. Yes, yes, they just grow up so fast! The more you spend time with your chicks, the better. They will get used to you and get used to being handled. This comes in super handy when they’re adults. If you need to, say, catch one for any reason at all. It’s a lot easier to bend down and pick them up than it is to race around the yard or chicken run with them flapping and screeching and you panting and swearing. A good rule of thumb for handling baby chicks: Wash your hands before you pick them up (to protect them from your germs) and wash your hands afterward (to protect you from their germs). 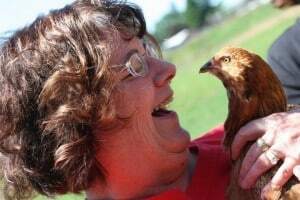 So many people talk about how much money they’ll save if they have their own chickens. I hate to break it to you, but you probably won’t save anything. In fact, it will most likely cost you MORE than if you purchased eggs at the store. You WILL receive other benefits besides eggs, though, and that should count for something. Like free fertilizer, entertainment, and bug eradication. The list goes on and on. 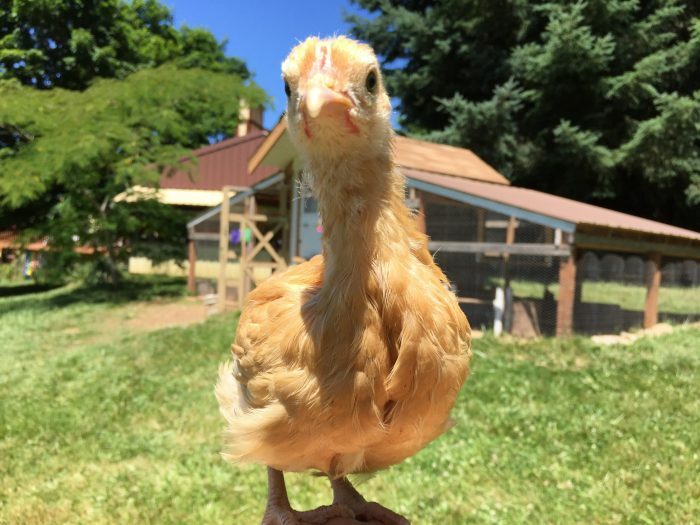 (Actually, if you need convincing, here’s more than 20 reasons you should raise chickens). Of course, it goes without saying that you will also have fresher, better tasting eggs than you can get anywhere else. Laid by happy hens (not in a battery farm). Bonus points: the eggs are actually better for you, too. The average-ish age for backyard hens are around 5-8 years. However, they can live longer (I have a friend who has three 13+ year old hens and I have one that’s 9). The record age for a hen is over 20. So, there is a chance that you’ll have these chickens for a long time. Raising chickens isn’t really a fly-by-night kind of thing. They aren’t a fad. If you get tired of having them around, you need to think of a plan for what you will do with them (thinking through this stuff before you get them is a good idea). Since we’re talking about the age of chickens, it might be good to insert that the best laying years are a hen’s first 2 years. After that, she will still lay eggs, but less and less as she ages (my 9-year old hen lays less than a dozen eggs a year at this point). People deal with this situation differently. Some cull (kill and eat) their older hens. Others let them live out their lives in leisure. Again, deciding how you will deal with this BEFORE you get chickens is a pretty good plan. Most hens stop laying from late fall through early spring. They might lay here and there, but not nearly as much as they do from spring through early fall. There are some breeds that lay well through the winter and also, the first year you have your hens they will lay all winter. But expect that generally your egg production will slow way down in the winter (unless you put a light in the coop through the winter–as they need 14-16 hours of daylight to lay eggs). 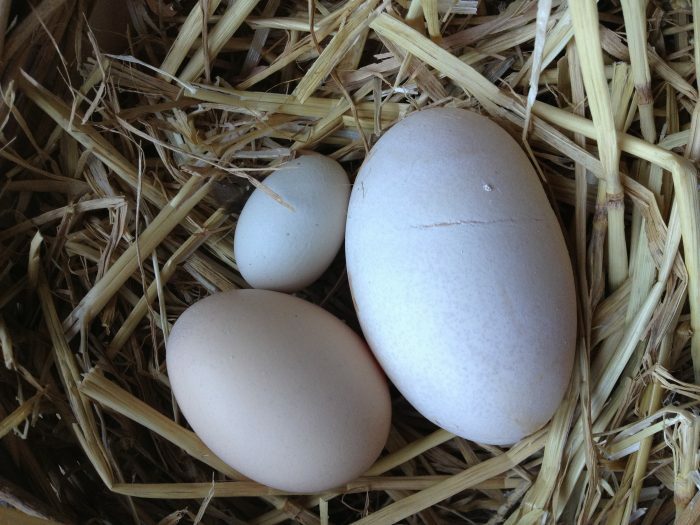 If you’re used to the perfectly white, exactly-the-same-size-and-shape eggs from the store, you’ll be in for a surprise with your own hens. They lay all sorts of shapes, textures and sizes (and colors, too!). Don’t be alarmed when you get an egg that’s tiny or oddly shaped or even shell-less. Imperfect eggs happen. Most of the time it doesn’t mean there’s a problem you should worry about. The list is pretty long. It seems like warm chicken dinner is a favorite among many animals such as raccoons, foxes, skunks, hawks, coyotes, dogs, rats (with chicks), owls, and more. So, it’s a good idea to build a coop that makes it hard for other animals to get in and for your chickens to get out. Isn’t that just so nice of them? It’s because chickens can’t see in the dark. Once dusk hits, they will head to bed on their own so that they don’t get caught out after dark. Ahh, that kids were so easy. Don’t panic if you go into the chicken coop one fall day and see what looks like the remnants of a pillow fight. Feather loss happens for a variety of reasons but the big loss will happen in the fall when they molt. Molting is just their way of shedding their worn out feathers and growing in some new ones so they’ll be toasty warm for winter (your first year chickens probably will not molt the first fall). Other feather loss can occur when they’re sick, frightened or picking them out because of bugs. Chickens are chickens, but they’re not stupid. They’re chickens. If you want to watch an interesting documentary by the BBC, you’ll see that they’re smarter than you might realize (and even easier to train than dogs, according to the BBC)!! Because, of course, they’re not stupid! Seriously, though, chickens are creatures of habit and if you repeatedly do something around them, they will grow to expect it, even anticipating it. For example, my free ranging flock will run (and even fly) as fast as possible to the back fence when they hear the kitchen door open and close. Why? Because more often than not, I have treats for them and they’ve come to expect that. When I let them out in the morning, they rush to the feed bins. If I’m not fast enough getting there, they’ll turn around and come back for me. Why? Because they know what to expect. In case you think I’ve just simplified everything, let me tell you a little story about my flock. They LOVED to congregate at the back (kitchen) door because they knew if I was cooking, I’d throw out vegetable scraps. But, last summer I added a back garden (that I didn’t want them in) so I built a fence around the garden to incorporate both it and the back patio. This took away their ability to stand outside the back door begging. So, instead, they started standing on the other side of the gate, waiting. Its the closest they can get to the back door. One day this past winter, I opened up the gates and let them in so they could dig around in the now dead garden. Later that day, I came out with veggie scraps in my hands. The chickens, seeing me come out with scraps, all turned around and rushed out to the other side of the gate. They’d learned that standing at the gate will get them snacks. Never mind that they were closer to me to before they took off for the gate! 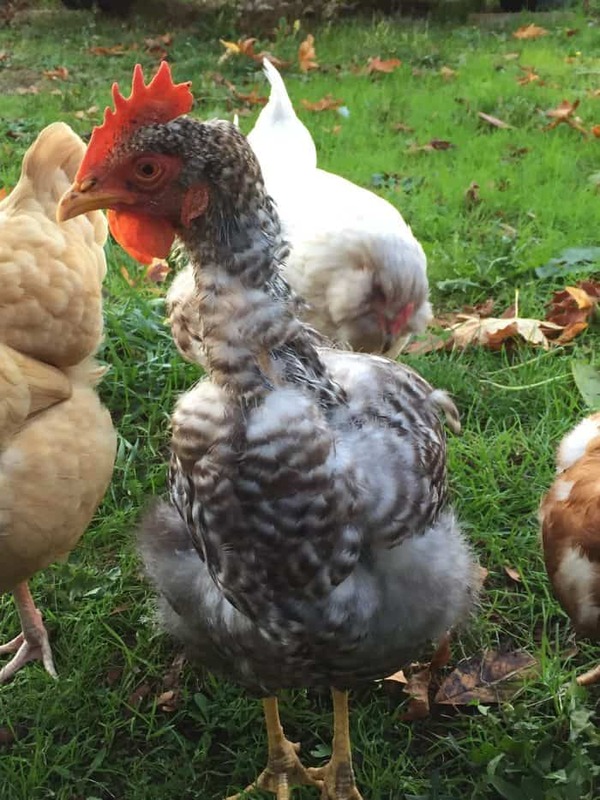 Do things in a repeated and deliberate manner and you can train those hens to do tricks, even! (Which is why I built a fence!) 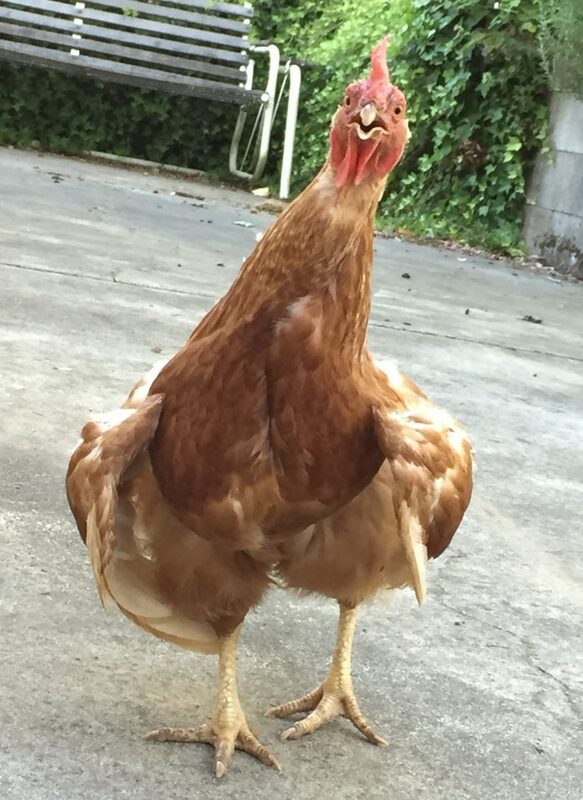 Chickens spend their entire day scratching around in search of food. It doesn’t matter to them if it happens to be in the garden or if they uproot plants. If they find vegetables to munch on while they’re in the garden, they’ll be happy campers and won’t think twice about eating it. Chickens will seriously do damage to your garden. Especially when the plants are young and small. Keeping them out of the garden is a good idea. But wait, you’ve probably heard that chickens are good for a garden, haven’t you? Well, that’s true too. 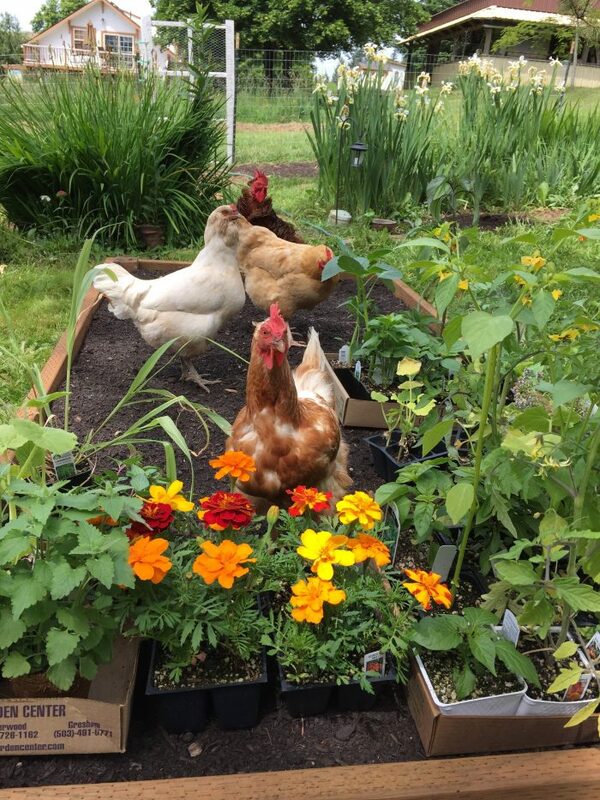 They create compost, they help aerate soil and they eat all sorts of bugs (they can debug 120 square feet per week per hen). I generally let my chickens hang out in the garden from after harvest until I plant the garden in the spring. But from spring through harvest, it’s off limits to them. How much, you might ask? Well, enough to produce 1 cubic yard of compost PER MONTH (per bird). That’s a lot. The good news is, you’ll never have to buy compost again. The bad news is, you’ll become obsessive about checking the bottoms of your shoes after you’ve been outside. Chickens are great fakers. What I mean by that is that they might be very, very sick and seem ‘fine’ at first glance. Part of their survival is to seem okay (remember that pecking order thing). You have to pay attention or you might not notice until it’s too late. Become an expert at what they’re body language is telling you. Chickens are both hearty and fragile at the same time. They can live through incredible adversity and fall over dead without warning. They’re also mysterious. They don’t want you to know they’re sick. And even if you notice, so many of the things that can go wrong with chickens all look the same. And even if you figure out what it might be, there may or may not be a treatment and it may or may not work for you if you try it. Also, you can build a Fort Knox Coop and still have a predator take out a chicken. Or have a flood. Or any number of issues. Life is unpredictable. Even if you do everything right. So, do your best. And breathe. It’s not all going to be perfect. But it will still be worth it. You will grow attached. Yes, to a chicken. Eventually they will die or get hurt or be in need of your extra care (which only endears you all the more). And when you lose them, it’s very sad. Chickens are hysterical. You’ll find that out the first hour you own them. And they keep going strong. Barnyard comedians, they are. It’s the best. You bring home a chick. And keep her alive for weeks while she grows feathers and gets big enough to move into a coop without a heat lamp. She goes through her gangly ‘teenage’ weeks/months where every day looks like a bad hair day (and only you, her mother (or father) could love her). She grows larger still. And you wait. And wait. One day, 5, 6, 7 months later (whenever she gets around to it), she lays an egg. The household celebrates. You whip out your phone and take a photo of her first egg. Then carry the egg around like a trophy. Finally, you post it on Facebook for everyone to see. It’s a big deal. Because before then, if you wanted eggs, you hopped in the car and drove to the store and bought some. Now, however, you are connected to the source of eggs. And you nurtured that source for many long months, feeding, fretting, caring for her, before she gave you food. I can tell you after nearly 10 years of egg collecting, it’s still amazing. I still marvel at the miracle of food and don’t take it for granted. I’m pretty sure it will change you, too. Slowing down and connecting to our food has a way of doing that. For the most part, chickens are built for winter and cold weather. They wear down coats, after all. 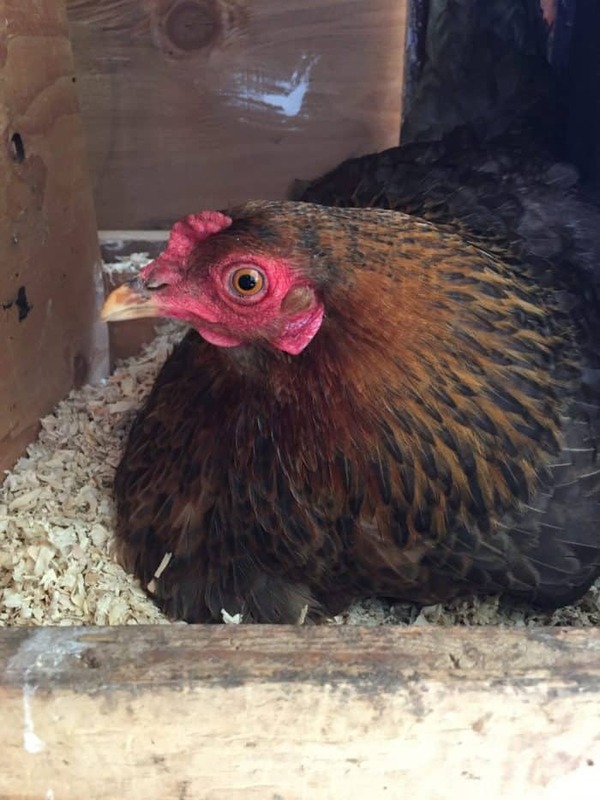 If you live in a super cold area, you might need to take precautions to keep them from getting frost bitten combs, wattles or toes, but heating the coop really isn’t necessary. Neither are sweaters for your chickens. Just sayin. A bigger threat to your chickens is hot weather, not cold. While there are breeds that are more tolerant to heat than others, soaring temperatures are hard on them. Make sure they have lots of cool, fresh water and plenty of places to find shade. Also, a place for dust bathing is important, as that helps cool them down. If I was ever going to stick something in the coop, I’d vote for a fan over a heater. (Also, if hens are too hot, they will often stop laying eggs!) And here are some more ideas to help your flock stay cool in the summer. Just because we eat it, doesn’t mean they can. For instance, while they love tomatoes, the tomato plant itself is toxic to them. So are avocados, raw potatoes and chocolate, among other things. Here’s a list of food to keep away from your flock. The same is true for medicine and essential oils for your flock. Be very careful and do your research before applying any product to your chickens (and when you do, remember that they are TINY compared to you so adjust your dosage accordingly). Every single one. It’s a blast watching their uniqueness unfold and develop. It’s entertaining, too. Consider yourself warned. Your pre-chicken self might not believe it, but it’s true. Chickens are endearing and delightful. And they make breakfast. 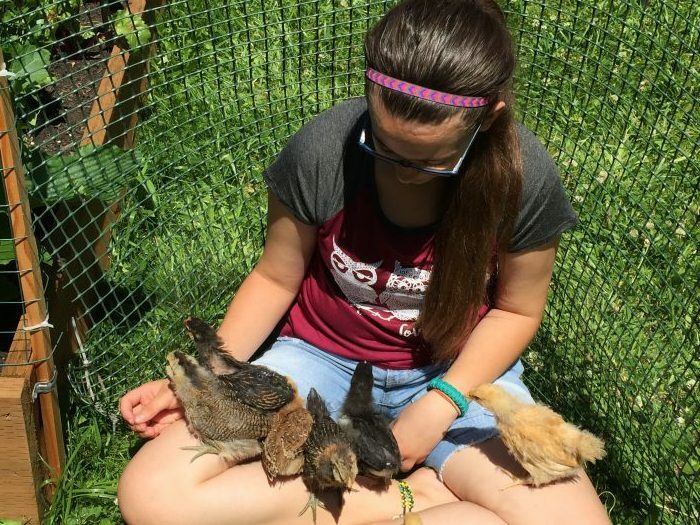 Owning chickens has changed my life (for the better) and I can’t imagine living without them. Whew. There you have it: 30 things you should know before you get chickens. Hopefully I haven’t talked you out of them. But, even if I did, that’s all good. If you know what you’re getting into before you take the leap, you’re more likely to have a great experience. 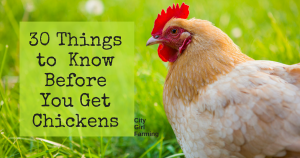 And just so you know, you’ll learn more than 30 things by raising chickens. But you should experience some of that all on your own. Enjoy!